Summer is here and we are all getting a little bit of a tan (or burn) and are starting to notice our foundation isn’t quite matching out skin tone. It happens to the best of us! But Veil Cover Cream gives you the option to perfectly match your foundation to your skin tone any time of year with our range of 40 shades! Best of all our Cover Cream includes SPF 15 so you’ll be protecting your skin at the same time. 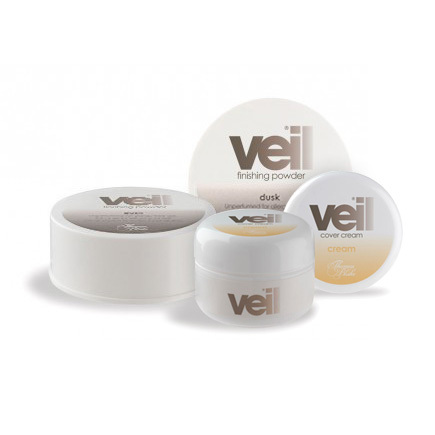 Find your perfect summer glow with Veil Cover Cream and as your natural tan starts to build easily blend a shade to match your skin. Here’s how to blend the perfect summer colour match. Step One: Mix and Match! Use as many colours and shades as you like to find the right shade for your summer skin. Use our Colour Demo Kit to add a different shade to your usual base foundation coverage. Use the spatula to gradually add different shades together. Remember each colour is used for different colour corrections or find out more about our Colour Correcting Concealers. Always apply makeup on natural light! The best application tip you’ll ever receive is to make sure you apply your foundation in natural light. Unless of course you are going on stage then you’ll need to apply your makeup under a mirror light. However, everyday makeup should be fresh and clean so avoiding dark spaces or using overly lit rooms is not advised. If you can, sit outside in the sunlight or near a window to keep your product application even and natural. When applying the product be sure to dab the product on to the skin evenly, DO NOT rub! Some areas may require more coverage than others so small amounts of product applied slowly will give you the best results. Always use a setting product to your finished foundation application. This ensures your foundation will stay for hours on end and keep your summer glow all through the day. Check out the Colour Demo Kit with 20 different shades to mix together your summer shade.